There are certain areas in London that are worthy of your visit each time you manage to arrive in this wonderful capital city, mostly because they are represented by unique or very interesting periodical events. And who does not like great plays, concerts and shows? In order to always be close to the spot where all the cultural activities happen, make sure to book a hotel located in Central London. A great choice is the Holiday Inn London – Mayfair, situated right in the West End area, this famous bohemian space. You can also access Oxford Street for great shopping sessions or visit one of the Royal Parks. All this in solely a few minutes after leaving the hotel. In addition to this, you will be thrilled about the offered facilities and the stylish interior design. In order to get a Stansted to Holiday Inn London – Mayfair Transfer by rail, you could take the train from Stansted Airport (every 15 minutes) via Tottenham Hale Underground (every 5 minutes). This journey will take about 54 minutes. The second option is to take a bus from London Stansted (every 60 minutes) followed by a Tube from Victoria Underground Station (every 5 minutes). This journey lasts about 1 hour and 19 minutes. You can also choose a bus from Stansted Airport, Coach (five times/day) followed by a 22 minute walk. This ride lasts 1 hour and 37 minutes. The last option implies a bus from Stansted Airport, Coach (every 120 minutes) via Bow Church DLR (line 25 – every 5 minutes) and Oxford Circus Stn Margaret St (every 5 minutes). This journey takes about 1 hour and 54 minutes from your time. A Stansted to Holiday Inn London – Mayfair Transfer by car can be done by taking the M11. Stansted Airport is at a 40.1 miles distance from Holiday Inn London – Mayfair. This journey will take about 58 minutes, without including traffic. A Stansted to Holiday Inn London – Mayfair Transfer with 247 Stansted Airport Transfer is going to take about 1 hour and 33 minutes, including rush hour traffic. 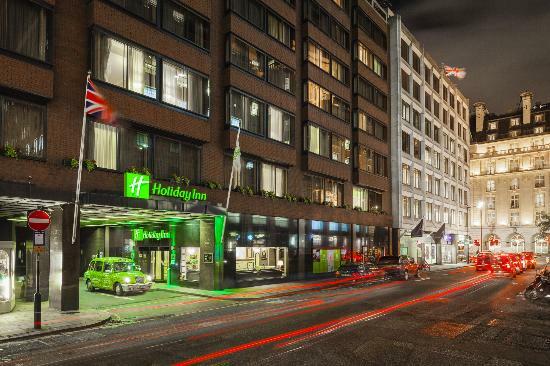 The price for a Stansted to Holiday Inn London – Mayfair starts from 59 GBP.